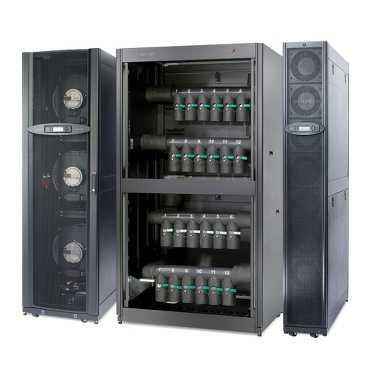 APC by Schneider Electric InRow Chilled Water Cooling close-coupled, chilled water cooling for medium to large data centers is the predictable solution for an unpredictable environment. APC InRow Chilled Water Cooling product design closely couples the cooling with the IT heat load. This design prevents hot air recirculation, while improving cooling predictability and allowing for a pay-as-you-grow environment. Available with and without humidity control, these products are designed to meet the diverse requirements for medium to large data centers. Data center operators looking to improve efficiency or deploy high density servers will benefit from the modular design of the InRow Chilled Water products. The intelligent controls of the InRow Chilled Water products actively adjust fan speed and chilled water flow to match the IT heat load to maximize efficiency and address the dynamic demands of today’s IT environments. Casters – Provides flexibility to move the unit to wherever cooling is required. Modular design – Modular design provides scaleable solutions to add cooling as demand increases. Scaleable densities – Allows for higher densities to be achieved by integrating containment with room, row and rack cooling system architectures. Active response controls – Monitors and actively adjusts cooling capacity to ensure proper server inlet temperatures. Through the microprocessor controller, visibility into the operation and health of the unit is provided. Dual A-B Power Inputs – Draws power from the UPS for power protection with dual feeds for redundancy. Predictable cooling – Placing the unit in the row of racks moves the source of cooling closer to the heat load. This eliminates air mixing and provides a predictable cooling architecture. Rack inlet control – Rack inlet control guarantees inlet temperature to IT equipment. Top and bottom chilled water connections – Allows chilled water to be connected from the top, if routing from overhead, or bottom, if on a raised floor. Building management system integration – Send alarms and data points allowing you to manage critical building infrastructure from a single system. Microprocessor controller – Provides proactive control and real-time monitoring via a four line, eighty character, alphanumeric display. Real-Time Capacity Monitoring – Real-time display of current and available cooling. Easy service access – Allows for all serviceable components to be replaced/maintained by easily accessible panels/doors. Row-based architecture – Captures hot exhaust air directly from the IT equipment, thereby increasing the unit’s sensible cooling capacity over traditional cooling architectures. Variable speed fans – Variable speed fans reduce energy consumption during off-peak cooling periods.